· 360 degree employee performance surveys are usually difficult and expensive to implement, but Survey/360 makes them easy and inexpensive. · 360 software often puts the user in a straightjacket, allowing only narrow capabilities for creating your own questions and rating scales, and little or no job-specific sample text to use and adapt to your own questionnaires. But, Survey/360 allows great flexibility and provides a job-specific library of sample questionnaire text. · Security and confidentiality issues are often dealt with inadequately, but Survey/360 provides a robust multi-level password security system, and all response data is encrypted for confidentiality. 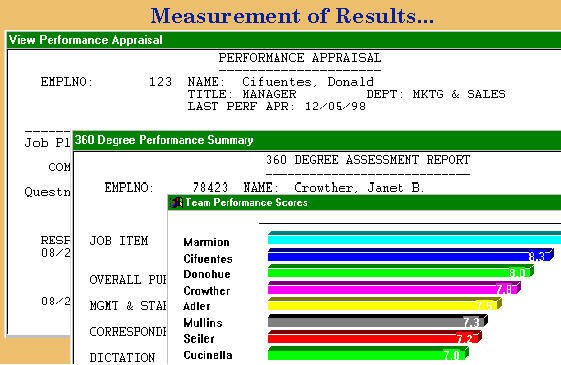 · Multiple rating scales available - performance, frequency, or make your own. · Weighted scoring available for each question, to reflect the varying importance of the topics being rated. 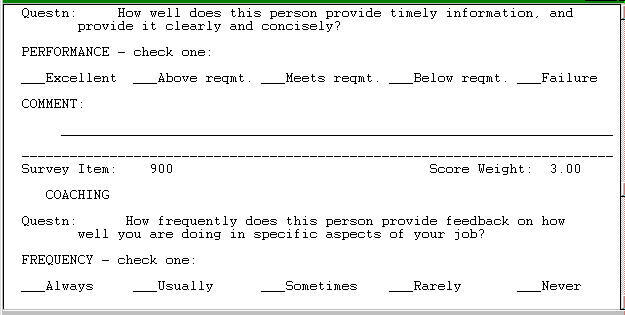 Questionnaires can be printed on demand or accessed on line. · Access and confidentiality are tightly controlled by a multi-level password security system. Designed for use by all types of organizations, a typical user is a large hospital in Texas with over 1400 employees. They reported excellent participation by their staff and positive reactions by ratees to their survey results. Basic 5-user network: $1,995 - additional concurrent user rights available at $350 each. 30% of first year license fee. If you are not completely satisfied with the Survey/360 single user version, just phone us for a return authorization code, uninstall it from your computer and return the product to us within 30 days of your purchase. Then we will refund your purchase price.